Korean J. Poult. Sci. 2019;46(1):1-10. Korean J. Poult. Sci. 2019;46(1):11-15. Korean J. Poult. Sci. 2019;46(1):17-24. 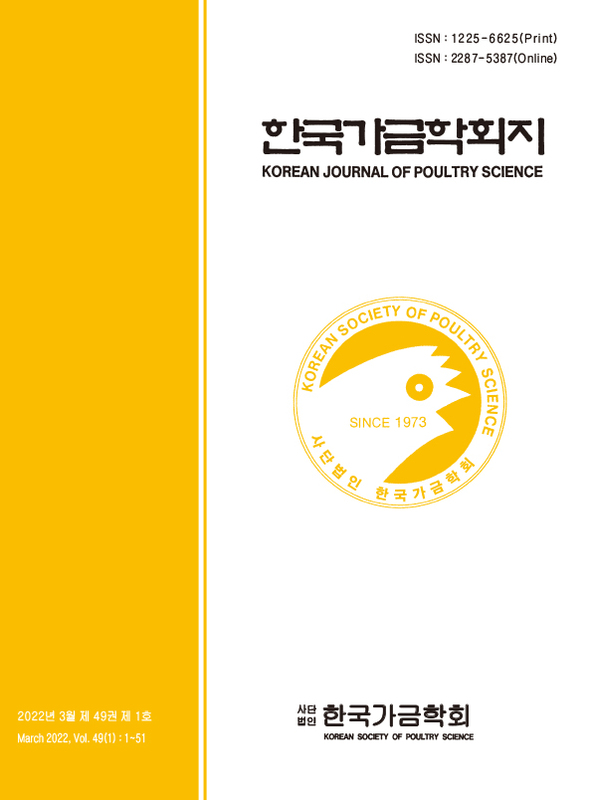 Korean Journal of Poultry Science, KJPS, is dedicated to promote the research based information related with poultry science. The official title of the journal is ‘The Korean Journal of Poultry Science’ and the abbreviated title is ‘Korean J. Poult. Sci.’ It was launched in 1973. KJPS welcomes original articles on basic and applied results in the area of embryology, biochemistry, biophysics, physiology, reproduction and genetics, behavior, immune system, microbiology, endocrinology, nutrition, environmental science, food science, feeding stuffs and feeding, management and housing welfare, breeding, hatching, production systems, processing, product development, poultry meat and egg yields and quality. Categories of papers open for submission are articles, reviews and research notes. It is published quarterly at the end of last day of March, June, September, and December each year. Korean Journal of Poultry Science is abstracted in Chemical Abstracts, BIOSIS, and listed in the catalogue of Canadian Agriculture Library, DOI/Crossref. The Korean Society of Poultry Science is a society that conducts research on poultry such as chickens, ducks, and poultry. It provides poultry and poultry industries in Korea through poultry research, technology development, and information exchange. The Society was established on July 1973 as the Korea branch of the World's Poultry Science Association. It was officially launched in December 1983 with the founding General Meeting of the Korean Society of Poultry Research. It is contributing to academic research and domestic industry development through academic activities such as publication of quarterly publications, symposium of industry-academy cooperation, academic conferences, and so on.